composition or rhythm doesn’t flow. 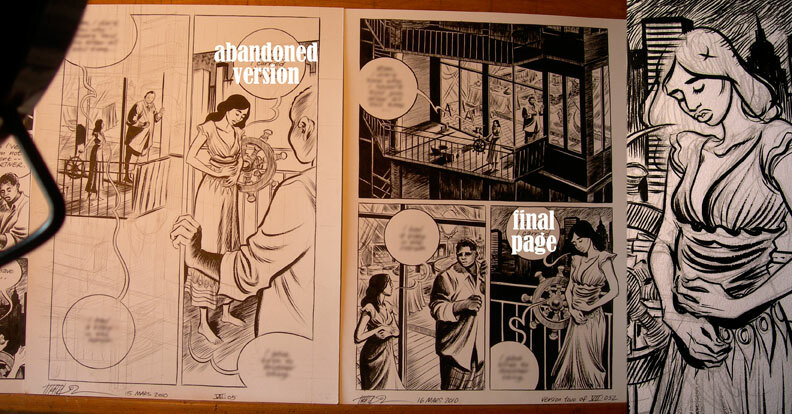 The fix is usually an extra panel or dialogue tweak or simply flipping the panel. Always better to catch this in the thumbnail version! I feel like I have been watching you for years… And I am still bowled over by your talent. You set a bench mark that is still so high! what dedication… my hands are too shaky to do such fine brushwork so i only use brushes for rougher sketchings these days and rely on colored recycled paper and scissors for the good stuff! i seriously can’t wait until this book is released here in belgium. thinking about a campout with some friends in front of the bookstore. These are incredible! I have to keep reminding myself how small these drawings are. The layouts are amazing and the everything has character right down to the tails of the word balloons! I’m gonna campout for this book here in the states, then tent with Annet for the Belgium release! As excruciating as it sounds to go back and redraw and alter the composition, I admire that you are just that dedicated and detail oriented. It will definitely pay off in the end. Keep up the fantastic work!!! I am a Graphic Design major at the University of Georgia, and for my illustration class we’ve been assigned to interview an artist whose work we really admire. You are a constant inspiration for my work as a designer so I was wondering if you would be willing to answer a few questions. I apologize for the length – I’m going to email you via your agent as well if that’s an easier solution. If you get a chance, I would be extremely grateful for any feedback. 1) Was Carnet de Voyage solely a journal of your travels or was it created in preparation for Habibi? Was that the intention of your trip initially or did your idea develop while you were abroad? 2) You said that Habibi was inspired by Islamic mythology and Arabic calligraphy – did you think your line work resembled Arabic calligraphy prior to the birth of Habibi or did you alter/mold your lines to fit? 3) I have a copy of both the English and Italian versions of Carnet, and on the back of the Italian version there is a bird drawing that strongly resembles Arabic calligraphy. The line quality seems significantly different – did you use a different pen/brush? Will the drawings in Habibi be similar? Also, what is the motivation behind changing the format/design of your works when releasing them in different countries? 4) Will your double-sided axe symbol (found throughout Blankets and Carnet) be manifested in Habibi? If so, has it changed or developed at all? What about the symbolism/line work in general ¬¬¬– will it look relatively similar to your previous graphic novels or has the line quality and/or style been altered to resemble Arabic calligraphy? 5) There is a clear progression in your work over time – your style in Good-bye, Chunky Rice being fairly illustrative and cartoonish, then develops into a more formal, realistic style in Carnet de Voyage and even more so in Blankets. How will Habibi fit into this progression/development? 6) It seems like many graphic artists establish a set storyboard layout to move the narrative along, fitting the content into the form, whereas it seems like you design the form to fit the content, thereby allowing the content itself to move the narrative and then molding the form to it. What priority do you place on the layout design of your works, and how do you establish it? I met you years ago at a Quimby’s event here in Chitown! I’m teaching a high school literature and drawing class and the kids really loved the project we did about Blankets! Cool work! Can’t wait to read it! Habibi is looking so excellent! Good luck finishing it. Excited to hear you’ll be at the Stumptown fest this year; hope to meet you! I have three ideas for long-form graphic novels, and I can’t decide which one is best! Would I be able to send in outlines for all three stories? It’s okay if I can’t, I’d just like to know if the option’s available before I fret over which story to send any more than I already have. Anyway, I don’t know if you can see my email or how this works, but if you could please reply to my question I’d sure appreciate it. Of course, I imagine your pretty busy with Habibi and life in general, so if you don’t have time to get back to me, I won’t hold it against ya! what is the likely release date for Habibi? do you have any advice for a young illustrator trying to begin in the industry?